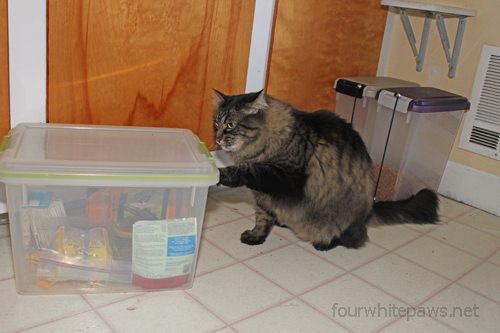 With the nugget bins now being secured with bungee cords, Nahum has turned his attention to the treat bin! My bet is on Nahum succeeding! 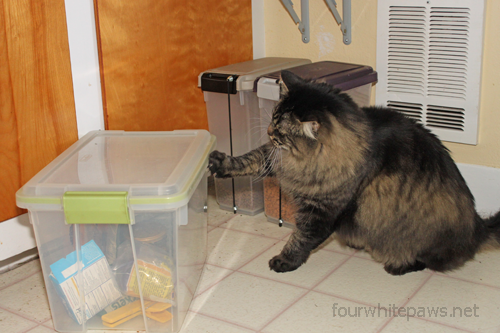 Where there are treats, there is a way for a cat to get 'em! If Charlie knows where treats are then there he is also! Nahum, go for it! Kitties like to keep their minds and paws active. Go for it, Nahum! I think it is better to keep those things out of sight. Poor guy must be really frustrated. He will never get those latches undone! Hmmm, maybe he needs help getting in there. I'll be happy to come over and help him. YUM! Nahum seems so smart! And I bet he is having fun right now.